DESIGN SQUAD . Share Solutions | PBS KIDS GO! Click on each step to navigate through the design process. When kids finish building, have them share what they've made with each other. This final step in the design process emphasizes communication and collaboration and is an effective way of wrapping up an activity. Gather them together and have them display their work. Review the goal of the activity, emphasizing how someone could benefit from what they've made. Ask kids to talk about their designs and point out their favorite features. Have kids talk about how they used the design process. What do you think is the best feature of your design? Why? What were the different steps you had to do to get your project to work the way you wanted? What steps of the design process helped you the most? What did you learn from watching other kids? What are some things everyone's designs have in common? Who might use what you've designed, and how would it help them? If you had more time, how could you improve your design? Green Machine: Volunteers from the Food Project, a nonprofit group that produces sustainable agriculture, challenge the DESIGN SQUAD teams to build a compost lifter for their urban farm. The Purple team has already presented their finished design—in this clip, it's the Green team's turn. Does anyone talk about how they used the design process? Record what they say in your workshop notepad (PDF, 204KB). What Happened? The Purple team discusses how they might have used the design process better, realizing that they spent too much time planning instead of building: "I think our working pattern was procrastination and then [a] dash to the end." Both teams also talk about the big picture—why they've built their compost lifters in the first place. A great ending to any activity is having the whole group ask each other questions and share their experiences. How can you encourage your kids to communicate what they've learned from the challenge? Can you channel kids' competitive tendencies in constructive ways? Record your ideas in your workshop notepad (PDF, 204KB). Try Feel the Heat with your kids. 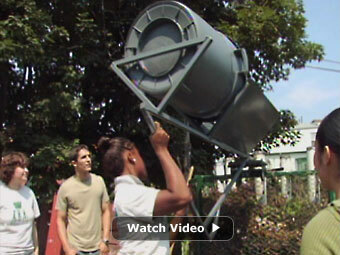 When they're done, have them share their solutions for building a solar heater. Get more resources from On the Moon, the NASA/DESIGN SQUAD Activity Guide.